Any written or verbal agreement between two or more parties whereby the parties are liable to obey the terms and conditions mutually agreed upon is called a contract. It is a legal binding on the contractual parties to follow the clauses written in the contract. If these are not practiced according to the pre-decided upon terms and conditions, either party has the right to get them enforced through the court of law. Hence it may be safely stated that any legal agreement that allows two or more parties or persons having a real lawful objective or goal and all its related elements and procedural details and is mutually signed by all concerned parties is called a contract. What is contract request form? 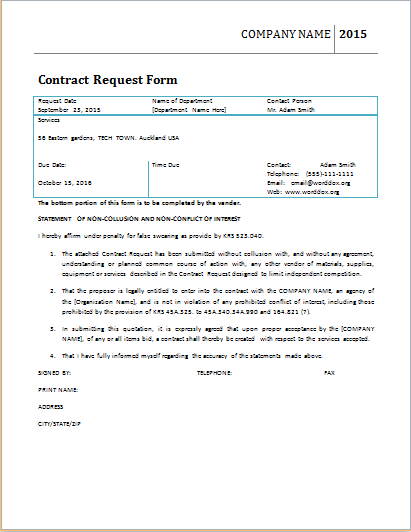 Contract request form is an already drafted document that is used by any party or person that wants to avail the services of another person or party. It is a text document in a legal format that acts as an application form for the initiation of services required by any party. It will not only contain details and information about the personal data and where about but also actual terms of the contract or deal like the pricing, rate, quality of service or product, quantity or duration of services and above all the mutual consent and willingness of all the concerned parties or persons. All the terms and conditions mentioned in the contract request form are legally binding and enforceable by the signing parties. Every contract has a time duration and validity after which it may require renewal and get expired.